Troops departing from Rio de Janeiro to Maranhão. The Balaiada was a social revolt that occurred between 1838 and 1841 in the interior of the province of Maranhão, Brazil. During the imperial period, the Maranhão region, which exported cotton, suffered a severe economic crisis because of competition with the increasingly productive United States. In addition, the cattle industry consumed a large part of the workforce in this region. These factors explain the involvement of the slave and poorly paid free workers in the movement. 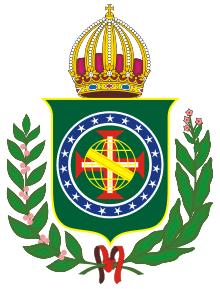 A political power dispute arose in the heart of the elite class, which was reflected in Maranhão by the opposition of liberals (bem-te-vis) and conservatives (cabanos). When Pedro de Araújo Lima, Marquis of Olinda became prime minister, provoking the so-called regresso conservador ("conservative regression"), the Maranhão conservatives took advantage of the opportunity to remove the liberals in power, and at the same time, weaken them further by contracting the service of the cattle ranchers, traditionally supported by the liberals. The event which began the revolt was the detention of the brother of the rancher Raimundo Gomes, from the ranch of his father Inácio Mendes, a liberal, by the order of a submayor of the town of Manga, José Egito, a conservative. Contesting the detention of his brother, Gomes, with the support of a contingent of the National Guard, invaded the municipal jail and freed him, in December 1838. Afterward, Gomes, with the support of Cosme Bento, an ex-slave with a force of 3,000 escaped Africans, and Manuel Francisco dos Anjos Ferreira, called the balaio ("basket") because he was a basketmaker, spread the revolt across the interior of Maranhão, conquering the second-most important city in the province, Caxias, and passing on to Piauí. Claudete Maria Miranda Dias. Balaios e Bem-te-vis: a guerrilha sertaneja (2a. ed.). Teresina: Instituto Dom Barreto, 2002. Maria de Lourdes Mônaco Janotti. A Balaiada. São Paulo: Brasiliense, 1987. Rodrigo Otávio. A Balaiada. Rio de Janeiro: Imprensa Nacional, 1942. Maria Januária Villela Santos. A Balaiada e a insurreição de escravos no Maranhão. São Paulo: Ática, 1983. This article is based on a translation of the corresponding article from the Portuguese Wikipedia.